(Honolulu)–Beginning on February 1, 2019 the operating hours of the ‘Iolani Palace State Monument grounds will change from 6:00 a.m. to 11:00 p.m. to an earlier closure time of 6:00 p.m. The Division of State Parks, in consultation with the Friends of ‘Iolani Palace (FOIP), who have a long-term management lease for ‘Iolani Palace, the Coronation Pavilion and the Barracks, have determined that this change is necessary to better protect the sanctity of the palace and preservation of its invaluable buildings and grounds. “Over the past several years, there have been increasing issues with vandalism including damage to a palace window and graffiti on historic structures. This is a result of night time vagrancy and items such as hypodermic needles being left on the grass. These are intolerable actions and this earlier closure is expected to eliminate the potential for vandalism and vagrancy,” said Division of State Parks Administrator Curt Cottrell. The illicit nighttime use is posing a challenge for the FOIP security staff who must currently wait until 11:00 p.m. to remove anyone on the grounds. “The discarded drug paraphernalia is offensive litter in a National Historic Landmark. The Palace is invaluable to our host Hawaiian culture. School groups and downtown office workers have informal picnics and lunches on the grounds and these materials pose a safety hazard to them,” said Cottrell. The Department of Accounting and General Services maintains the landscape and manages the parking area, and the Division of State Parks regulates the use of the grounds. Vehicles left in stalls after 6:00 p.m. will be monitored by FOIP security and they will ensure that the vehicles can leave. Some people frequent the grounds with their pets, and as a reminder – animals, including animals on leashes, (except for service, guide, or signal animals) are only allowed by permit. 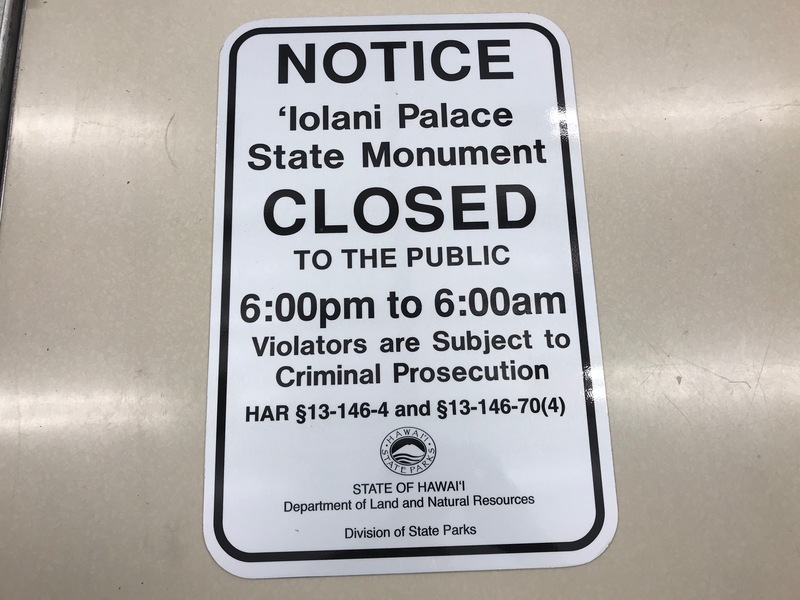 The revised hours of operation will be the same as Diamond Head State Monument, while the hours of operation for the Royal Mausoleum State Monument (8:00 a.m. to 4:30 p.m.) will remain as is. These are the three iconic State Monuments on O’ahu. For ‘Iolani Palace, after hours use of the grounds may be allowed by permit issued by State Parks or through an event hosted by FOIP.